The glasses have arrived at the schools! Bright colors and hip designs appeared as every pair was unpacked. Absolute joy and excitement with every pair received. Watching an 8 year old place the glasses cautiously on his face, looping one ear then the other carefully as he raised his face upward to see classroom posters, maps, alphabets, clocks, that he had never really seen before. He said the “colors” had been there but nothing else. His sense of awe was palpable across the desk. The scene repeated itself over and over again throughout Bellevue Schools. On October 18, 2012, Dr. Sam Hsu of Redmond, 141 Eyewear (they drove up from Portland, Oregon!) Greater Bellevue Lion’s Club and JUBILEE Reach came to Odle Middle School to set up shop for Bellevue students in need of glasses. The event was scheduled to begin at 3:00 and by 2:30 families were lined up, hoping to see the Doctor. As people spilled into the Odle library, volunteering BSD school nurses began initial screenings and sign ups. Moms, dads, grandparents, guardians, aunts and uncles had all made great efforts to be there with their students. Leaving work early, long bus rides, bringing infants and toddlers along. Every student was screened and those showing vision deficits were moved onto Doctor Hsu for examination. 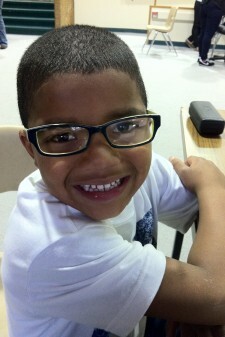 Thirty four were given full optometric examination, prescribed glasses and fitted with beautiful frames! An amazing effort completed in three hours! Thank you to everyone involved for making this meaningful event a reality for so many Bellevue students. The overwhelming generosity of time, funds, travel and time cannot be measured.